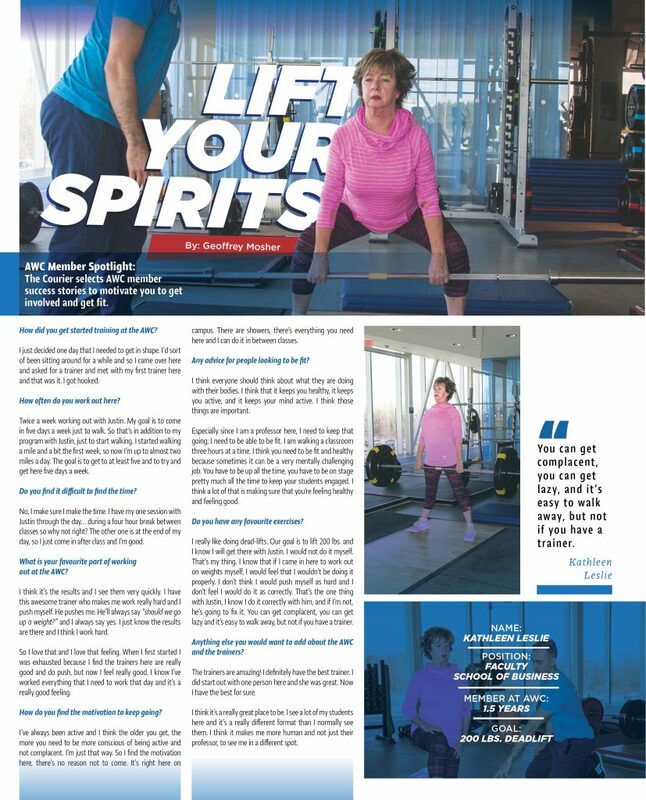 AWC Member Spotlight: The Courier selects AWC member success stories to motivate you to get involved and get fit. How did you get started training at the AWC? I just decided one day that I needed to get in shape. I’d sort of been sitting around for a while and so I came over here and asked for a trainer and met with my first trainer here and that was it. I got hooked. How often do you work out here? Twice a week working out with Justin. My goal is to come in five days a week just to walk. So that’s in addition to my program with Justin, just to start walking. I started walking a mile and a bit the first week, so now I’m up to almost two miles a day. The goal is to get to at least five and to try and get here five days a week. Do you find it difficult to find the time? No, I make sure I make the time. I have my one session with Justin through the day… during a four hour break between classes so why not right? The other one is at the end of my day, so I just come in after class and I’m good. You can get complacent, you can get lazy, and it’s easy to walk away, but not if you have a trainer. What is your favourite part of working out at the AWC? I think it’s the results and I see them very quickly. I have this awesome trainer who makes me work really hard and I push myself. He pushes me. He’ll always say “should we go up a weight?” and I always say yes. I just know the results are there and I think I work hard. So I love that and I love that feeling. When I first started I was exhausted because I find the trainers here are really good and do push, but now I feel really good. I know I’ve worked everything that I need to work that day and it’s a really good feeling. How do you find the motivation to keep going? I’ve always been active and I think the older you get, the more you need to be more conscious of being active and not complacent. I’m just that way. So I find the motivation here, there’s no reason not to come. It’s right here on campus. There are showers, there’s everything you need here and I can do it in between classes. Any advice for people looking to be fit? I think everyone should think about what they are doing with their bodies. I think that it keeps you healthy, it keeps you active, and it keeps your mind active. I think those things are important. Especially since I am a professor here, I need to keep that going; I need to be able to be fit. I am walking a classroom three hours at a time. I think you need to be fit and healthy because sometimes it can be a very mentally challenging job. You have to be up all the time, you have to be on stage pretty much all the time to keep your students engaged. I think a lot of that is making sure that you’re feeling healthy and feeling good. Do you have any favourite exercises? I really like doing dead-lifts. Our goal is to lift 200 lbs. and I know I will get there with Justin. I would not do it myself. That’s my thing. I know that if I came in here to work out on weights myself, I would feel that I wouldn’t be doing it properly. I don’t think I would push myself as hard and I don’t feel I would do it as correctly. That’s the one thing with Justin, I know I do it correctly with him, and if I’m not, he’s going to fix it. You can get complacent, you can get lazy and it’s easy to walk away, but not if you have a trainer. Anything else you would want to add about the AWC and the trainers? The trainers are amazing! I definitely have the best trainer. I did start out with one person here and she was great. Now I have the best for sure. I think it’s a really great place to be. I see a lot of my students here and it’s a really different format than I normally see them. I think it makes me more human and not just their professor, to see me in a different spot.